Posted on October 9, 2013 by Candy McSween Posted in Retail Therapy, Saving Money, This is Life	. Hah! If you've read here at all, you know I do everything on a budget! So decorating for any season would have to be done frugally. Our living room (great room?) has a large stone fireplace as the focal point. I adore it, but it also bugs me. It's missing a mantel. Which I'm sure was supposed to be the design of it. But I just prefer a mantel. It's one of the items I'm on the hunt for, at a bargain price of course. But until then, I content myself with decorating the hearth – expecially in the months too warm to actually use the fireplace. This week, the Hubster "found fall." We'd packed it up last year and promptly um…lost the box. But it's been found and I could commence 'fall-ifying' the house. 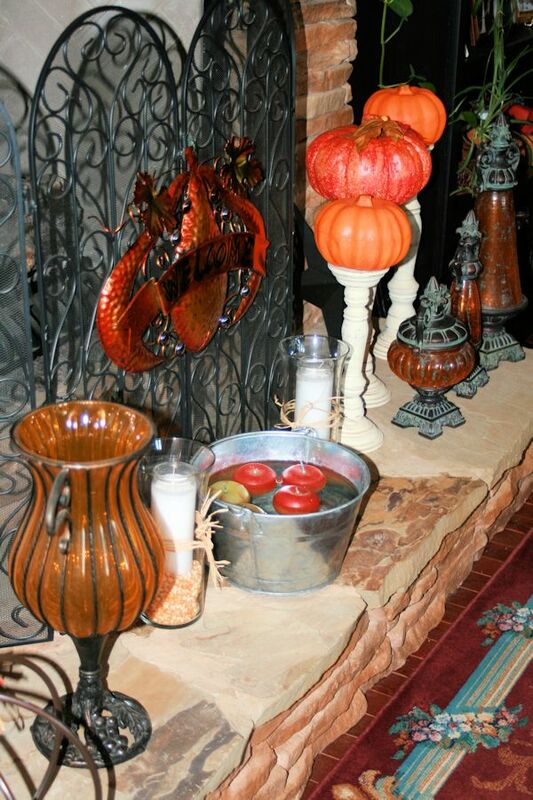 We don't celebrate Halloween around here, but pumpkins and leaves are right up my alley! 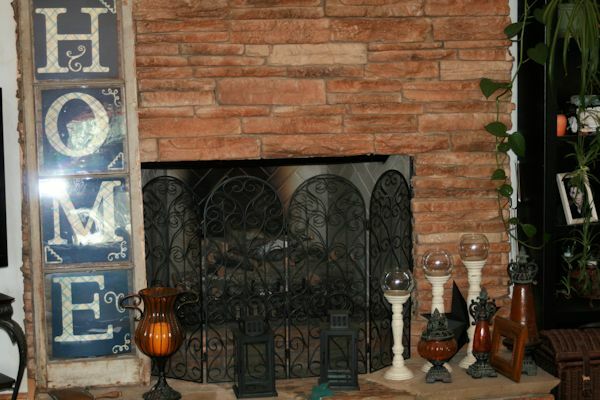 Here's the before pic of my hearth – it's pretty generic and tired looking. It definitely needed some perking up! And after I pulled out my fall decorations? 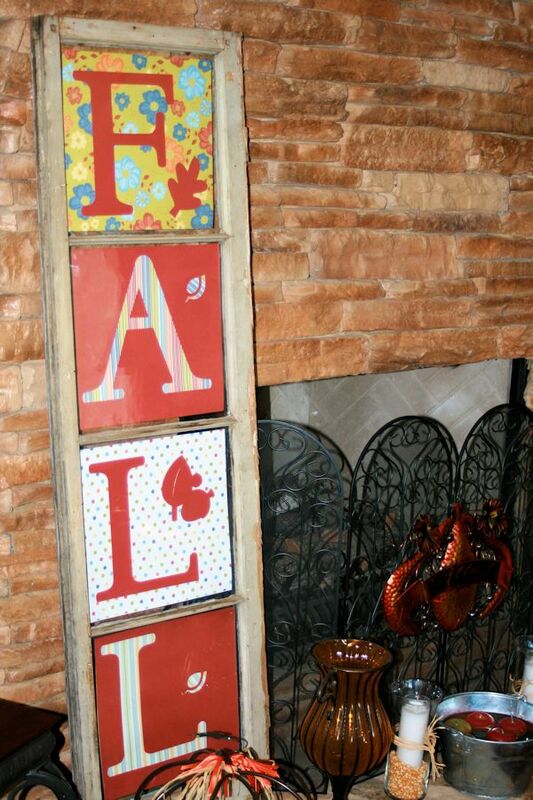 From left to right…the sign on the left is an old window I bought off a local yard sale site for $20 – it stays on my hearth year round and gets new words/saying for the seasons. The wire pumpkin came from Goodwill. The orange vase came from a local thrift shop. The candles with popcorn in them? They are glass containers from the Dollar Tree with 'religous candles' from the Dollar Tree inside. Then I have my candlesticks I bought off another local yard sale site. Just $8 for all 3, topped with Dollar Tree and WalMart (clearance) pumpkins. The three orange accent pieces on the right are from the furniture store closing sale. 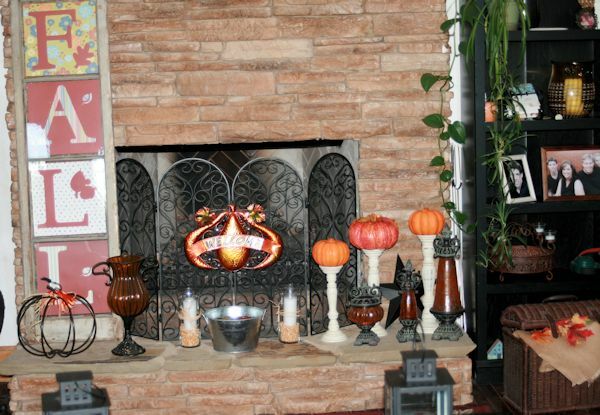 On the fireplace screen is a welcome fall sign from Big Lots. I bought it last year on the end of season clearance. Cute, huh? Oh! And the metal bucket in the middle? That's actually water in it, with apple floating candles inside. Yes, we have 2 active indoor dogs. Okay, one active dog and one sedentary dog. But so far, so good. They haven't paid any attention to the water. Tags: budget, decorating, Dollar store	.